There were 118,029 drivers involved in rear-end injury car accidents and 405 drivers involved in rear-end collisions with fatalities in California in 2011, according to the California Highway Patrol (CHP). If you have been injured in a rear-end car accident, or someone you care about has been injured or killed in a rear-end car collision, or any car accident anywhere in Los Angeles, the San Fernando Valley or in the state of California, we invite you to contact our expert rear-end impact car accident injury lawyers now for an absolutely FREE COURTESY CONSULTATION. If you need any help, please contact us now. What is a Rear-End Impact Collision? A rear-end collision occurs when during a traffic accident the front of a vehicle (usually a car or truck) collides into the rear of the vehicle in front of it. Such collisions are typically called rear-end collisions and often result in injury, including injuries to the neck (often called whiplash injuries), shoulders and back, and sometimes even cause wrongful death. Most rear-end traffic collisions involve two vehicles, but some rear-end accidents may involve more than two vehicles often called “multi-vehicle collisions”. In a typical three vehicle rear-end collision, the first two vehicles in line are stopped when the third vehicle hits the second or middle vehicle (first impact), causing the middle car to move forward, impacting with the first car (second impact), thereby causing the occupants of the middle car to actually suffer two (2) impacts. In some multi-impact rear-end collisions more than one car or motor vehicle is moving at impact, leading to some complex injury and liability questions. Immediate investigation and assistance of an experienced personal injury car accident attorney is advised. Weather conditions, including rain, wet and iced roads. Fault and responsibility (i.e., legal liability) for rear-end accidents is almost always on the driver of the car that rear-ends the other car usually due to not leaving enough stopping distance and/or lack of attention. An exception to this general rule occurs when on rare occasion the front (“rear-ended”) vehicle is in its reverse gear and actually moves into and hits the front of the vehicle behind it. This exception typically occurs in a parking lot or when a vehicle stops over the limit line for a red light, then reverses to exit the intersection but the driver carelessly forgets to return to the drive gear so that when the light turns green and the driver accelerates the car travels in reverse into the front of the vehicle behind it. “The driver of a motor vehicle shall not follow another vehicle more closely than is reasonable and prudent, having due regard for the speed of such vehicle and the traffic upon, and the condition of, the roadway.” Vehicle Code Section 21703. “No person shall drive a vehicle upon a highway at a speed greater than is reasonable or prudent having due regard for weather, visibility, the traffic on, and the surface and width of, the highway, and in no event at a speed which endangers the safety of persons or property.” Vehicle Code Section 22350. Therefore, in California, the driver or operator of the car, truck or other vehicle that rear-ends another vehicle is usually deemed at fault for following too closely for the roadway conditions and/or for speeding or traveling at a speed that is too fast or not reasonable for traffic or weather conditions. The most common result of a rear-end collision is property damage to the vehicles involved and injury to the occupant(s) of the vehicles. In a typical two-vehicle rear-end collision, the property damage is to the rear of the first vehicle and front of the second vehicle. The amount of damage to each vehicle varies depending on the type and structure of each vehicle. For example, sometimes we see a small car with major rear-end bumper damage and little or even no damage to the front of a truck that caused the rear-end accident. Other times we see little visible damage to the rear of the front vehicle (e.g., when it has a stronger, impact absorbing rear bumper) while the entire front-end of the second vehicle (i.e., the car rear-ending the first vehicle) shows major grill and other damage. 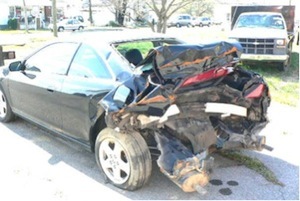 We have handled many rear-end accident claims when the damage to our client’s car showed little visible damage, but on investigation we discovered substantial frame damage to our client’s vehicle and/or damage to the front of the responsible vehicle. 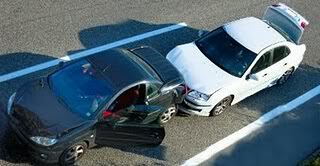 Such evidence is important as insurance adjusters dispute injury when the visible property damage to the claimant’s car is not significant. Accordingly, to help prove injury claims, especially when the first car (i.e., the car that was rear-ended) shows little visible property damage, it is very important to document the damage to each vehicle with photographs taken at the scene followed by a careful inspection of the vehicles, especially for not readily visible hidden damage like frame damage, and obtaining copies of the vehicle repair estimates for each vehicle. In a typical rear-end injury accident, the front vehicle is a stopped car then is struck from behind by a moving car or truck. Due to surprise and the relative weight of these vehicles, it is our experience that the injury is greater to occupants of the vehicle being struck (probably because they are surprised by the impact and unable to properly protect themselves) and worse to the occupants in a car or smaller car than a truck or heavier car due to the relative weight differences, laws and principles of momentum (mass times velocity of a vehicle) and the protection offered by a heavier vehicle. Common injuries caused by rear-end collisions include injuries to head (concussion) and face, including to one’s jaw often called TMJ injuries, neck and whiplash injury, shoulder, back and knees. Some of these injuries can be serious requiring surgery to one’s neck, back and/or knee. Prompt medical attention is advised. Our rear-end car impact car accident injury lawyers seek all damages and compensation permitted under California law, including for all medical & hospital expenses; loss of earnings and earnings capacity; loss of enjoyment of life activities; all pain, suffering, inconvenience & emotional distress; punitive & exemplary damages when appropriate; and, of course, all damages for property damage, including for repairs, total loss, rental, loss of use (even when another vehicle is not rented) and diminution in value when the damaged car or vehicle is worth less post repairs then prior to the subject collision, as more full explained in our section on Car Accident Damages. How to Find an Experienced Rear-End Car Accident Injury Attorney? Our car accident injury lawyers have been representing injured victims of rear-end car accidents and truck and other motor vehicle collisions throughout all of Los Angeles and California for over 40 years. During that time, our personal injury law firm has successfully resolved many thousands of car accident cases and recovered over $100 million for our clients. If you or someone you know has a rear-end car accident or other personal injury case, we would like to discuss representing you or the person you know. We invite you read about our rear-end car accident attorneys and also to see what others say about us. The insurance companies have trained adjusters working to increase their profits and either limit or even deny your claim, so please do NOT let them take advantage of you. We want to help you. Please call or email our rear-end impact car accident law offices now for an absolutely FREE consultation with an experienced car accident injury attorney or any other member of our rear-end collision car accident legal team. If you had a car accident, our personal injury & wrongful death accident lawyers offer an absolutely FREE & CONFIDENTIAL case consultation and evaluation and we work on a contingency fee. That means there is NO fee until you WIN and then the fee comes out of the recovery usually paid by the other parties’ insurance company and not out of your own pocket.